I just love it when it comes to Sunday afternoons. Those are the days where, as a family, we wind down, watch football, eat some comforting food, and get ready for the week ahead. It seems as though Sundays are often the times I am also the most creative in the kitchen. It could be that I’m scurrying to throw something together before the football starts, or it very well could be that I am completely relaxed, who knows. But a while ago I threw together some Greek chicken that just rocked in terms of flavor, and I had a couple of pieces left, so I wanted to come up with something to make out of it. Two things came to mind. Nachos and football. So let it be written, this was going to go down as my take on Greek nachos. I am a huge fan of nachos, and big fan of Greek flavors. I love those kalamata olives, I really do. My wife on the other hand is not so much a fan of the Greek flavors, especially when it comes to olives, and any olives for that matter, so I knew I was on my own in this journey. I was fine with that. I knew these would just work really well, and they did. Add the pita wedges to a sheet tray, laying them evenly onto the tray. Lightly spray the pita wedges with the cooking spray and season with a bit of salt. Place the sheet tray into the preheated oven and cook for about 10 minutes, or until the pitas have turned crisp, but not burnt. Those are now your nacho chips. I use a fajita skillet for my next step, however I’m sure not everyone has a fajita skillet laying around. I actually use my fajita skillet for nachos more than I do for fajitas. Go figure. If you do not have a skillet, simply overlap your pita chips to build your nachos. See how I stacked mine around in the picture below. As you are layering the nachos, sprinkle some of the mozzarella cheese in between the wedges as that will become your cheesy glue, keeping the wedges in tact. Next, layer on the feta cheese, and top with the diced chicken, and shallots. Place back in the oven for about 5-10 minutes or until the cheese becomes melted. The feta will not fully melt, but don’t worry about that. Once the cheese is melted, remove from the oven and shower on the tomatoes, olives, and cucumber. Dig in. These Greek nachos were really, really good. 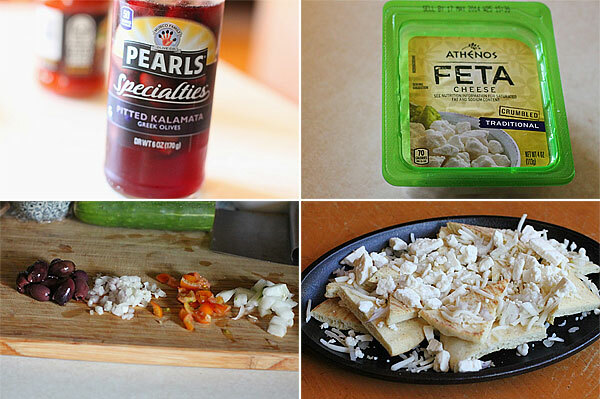 The pita chip is a perfect vehicle that delivers the great taste from the Greek chicken, then the slight bite of the shallot gets blended very nicely from the sharpness of the feta cheese and olives. If you wanted to take these a step further, you could drizzle a bit of tzatziki sauce over the top, or serve it on the side. If you are looking for a new idea for serving up nachos, give these a shot. Hope you enjoy! I use a fajita skillet for my next step, however I'm sure not everyone has a fajita skillet laying around. I actually use my fajita skillet for nachos more than I do for fajitas. Go figure. If you do not have a skillet, simply overlap your pita chips to build your nachos. See how I stacked mine around in the picture below. Place back in the oven for about 5-10 minutes or until the cheese becomes melted. The feta will not fully melt, but don't worry about that. Once the cheese is melted, remove from the oven and shower on the tomatoes, olives, and cucumber.